Really enjoyed our stay. Apartment was great for the money. Staff were very helpful. We would definitely stay here again. Great spot for families. Friendly and helpful management, abundance of clean bbq’s, clean pool, some extra parking spaces available for boats / trailers / extra cars and convenient location. very friendly owner, easy and close with walking distance to all we need. Apartment was big and clean and the facilities were great! Great location , clean , comfortable and affordable, quiet . Was very clean & comfy. Only 5min walk to main shops & beach. The rooms were clean and comfortable. The staff friendly and helpful and we were greeted with a big smile and a happy to see you attitude. The appartments are in a central location with easy walking to the hotel, the grocery store and much more, perfect spot. Lock in a great price for Rainbow Getaway Holiday Apartments – rated 8.5 by recent guests! Rainbow Getaway Holiday Apartments This rating is a reflection of how the property compares to the industry standard when it comes to price, facilities and services available. It's based on a self-evaluation by the property. Use this rating to help choose your stay! 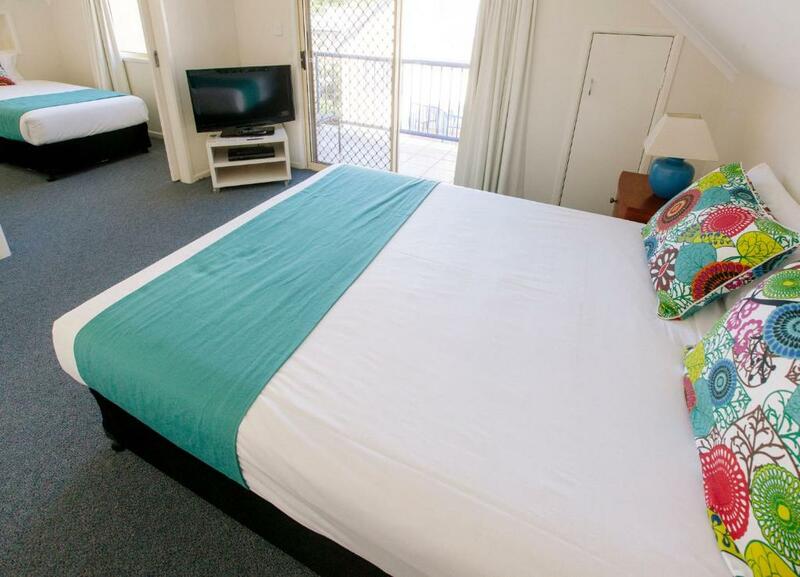 One of our top picks in Rainbow Beach.Rainbow Getaway Holiday Apartments is centrally located, 5 minutes' walk from the beach and offers 1, 2 and 3-bedroom self-contained accommodations with full kitchen and laundry facilities. It features an outdoor pool, a fitness center, an onsite playground, free on-site parking and free WiFi. Fully air-conditioned, the spacious apartments come with a DVD player and a flat-screen TV with cable channels. 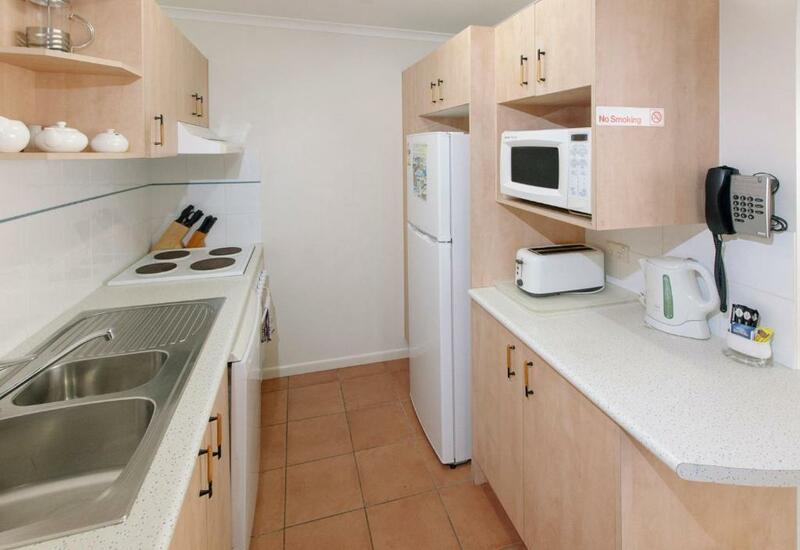 The attached kitchen has a dishwasher, an oven and a stove. Each apartment has a washing machine and dryer. Most apartments offer a spa bath in the private bathroom. All linen is provided. Ground floor apartment have direct access from the lock up garage and offer a private patio off thee living area. 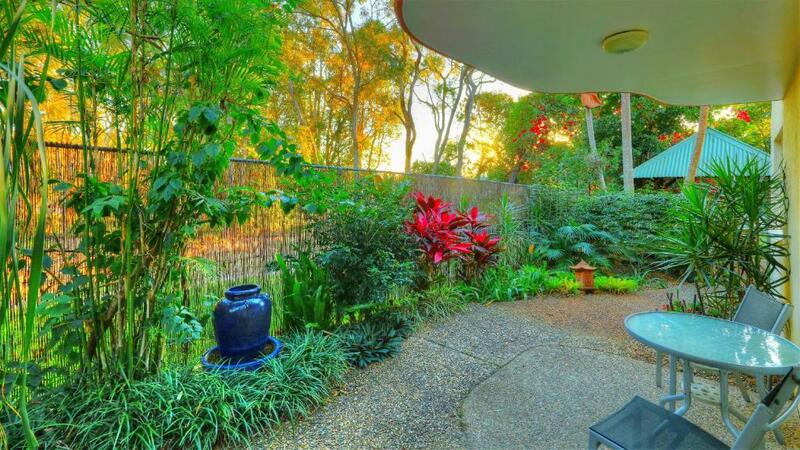 Guests can enjoy a barbecue in a garden setting, or rent movie titles from the DVD library. The staff at the tour desk can assist with booking tours of Colored Sands and Fraser Island. Activities like dolphin feeding, paragliding and horse riding on the beach can also be arranged. Holiday Apartments Rainbow Getaway is 150 feet away from Great Sandy National Park and a 3-minute drive from Wolf Rock Dove Center and a 15-minute walk from Carlo Sand Blow. When would you like to stay at Rainbow Getaway Holiday Apartments? Air-conditioned apartment has a full kitchen, laundry facilities and a flat-screen TV with DVD player. Air-conditioned apartment has a full kitchen, laundry facilities and a flat-screen TV with DVD player. The private bathroom comes with a spa bath. This air-conditioned apartment has a spa bath, a fully equipped kitchen and laundry facilities. The living area offers a flat-screen TV with a DVD player. This air-conditioned apartment has a spa bath, a fully equipped kitchen and laundry facilities. The living area offers a flat-screen TV with free cable channels and a DVD player. 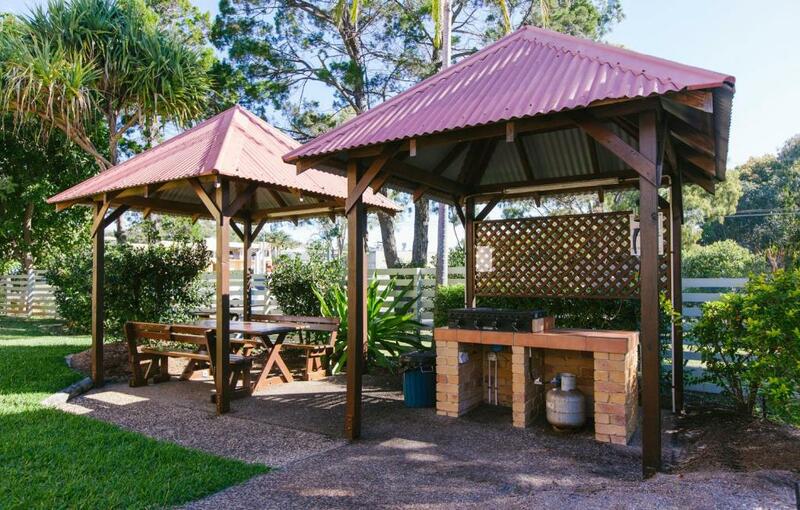 The team at Rainbow Getaway have been assisting people with their holiday in Rainbow Beach for over 11 years now. We know the area and can recommend many activities and experiences you will not see promoted elsewhere. If you have children or if you are a couple either way you will love the space, openness and grassy areas around the property. The property is very well maintained even though it is an older facility. All the apartments are maintained to a 4 star level and we pride ourselves on having extremely clean and well appointed apartments. Rainbow Getaway is also a great base for day trips to Fraser Island or Double Island Point. We look forward to welcoming you to what we consider one of the best places in Australia. Myself and family have lived in the area for over 10 years and we just love it. Lots of open spaces, amazing, beaches and lots of hidden gems that are often not reported anywhere else. In the process f raising 4 children we cannot think of a more perfect place for people to holiday. Even when town is busy the queues are short with no traffic lights or congestion to deal with. In fact you can pretty well walk everywhere as most services and attractions are within 5 minutes of Rainbow Getaway. I would have to say we live in one of the safest communities I have lived. We are very comfortable having our childern ride 2 km's to the local primary school or heading off for a scooter or skate at the local skate park. Our children are blessed to be raised in a community where the locals look out for you. We have a nice variety of shops, restaurants and entertainment. In fact everyone that visits Rainbow are often surprised at the variety and quality of shops, restaurants and entertainment. House Rules Rainbow Getaway Holiday Apartments takes special requests – add in the next step! Rainbow Getaway Holiday Apartments accepts these cards and reserves the right to temporarily hold an amount prior to arrival. If you expect to arrive outside reception opening hours, please inform Rainbow Getaway Holiday Apartments in advance, using the contact details found on the booking confirmation. Please note that there is a 3.71% charge when you pay with American Express credit cards. We did find the beds quite firm. Could be easily fixed with an underlay. The garage was quite difficult to get into with a big car but we liked the idea of being able to lock away bikes, scooters, etc. There was some kind of mix-up about my booking from 30th of December . They could not find my reservation. The room was not ready - bedroom fan/light did not work. It was not pleasant to sleep. The room, pool area and the whole resort was very clean and tidy. The surrounding nature was beautiful, safe and peaceful. The place was perfect for my training (running marathons ) purposes . Thank You. Having to climb the stairs. The wifi in the bedroom wasn't great (but was great in the lounge). The unit we had was right along the main road so you could hear the trucks and nearby hostel. Well located, easy walk to the centre. Bed was comfortable and the whole unit was spacious. Great to have a parking spot. Check in/out was very easy. Pool was lovely. Spacious clean unit with full facilities.